One of their guests asked me, Don’t you get tired of doing all these weddings? Sandi + Trey’s wedding had been my 23rd wedding for year 2017 so this wasn’t an outrageous question at all. In fact, it was a really good question. So good that I had to pause for a minute to reflect back on every wedded couple I had met this year. By this point, I’m sure the guest was expecting a standard answer for what was suppose to be short talk but I really took their curiosity to heart because it was a question I wanted to hear myself. No, I finally answered with the biggest smile across my face. No, I’m not and I haven’t. You see, in that moment, I looked over to Sandi + Trey as they danced the night away. 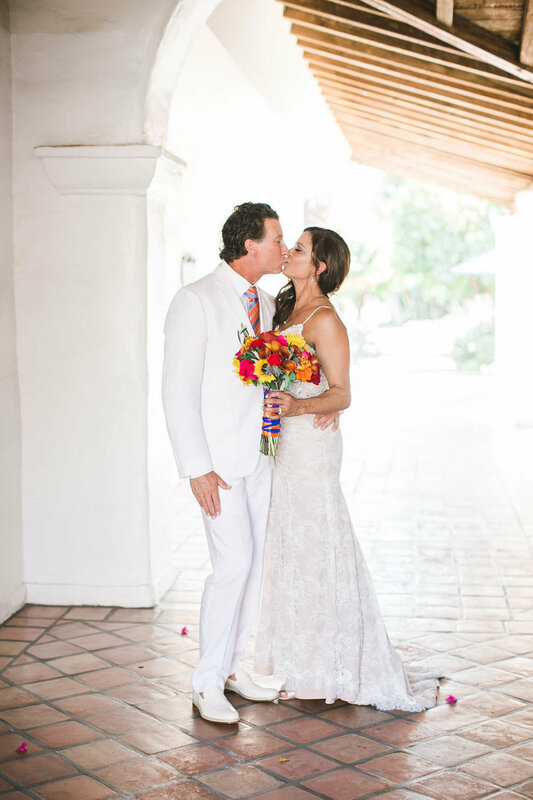 Their love story began 12 years ago in Manhattan beach. They never planned to have a wedding but somehow their love for each other and for their family and friends led them that way. They were surrounded by loved ones dressed in their finest white attire. They dove in and splashed around in the La Quinta Resort & Club Wedding pool. And they partied and I mean...partied like there was no tomorrow. The traditions I document are typically always the same in my profession. The hearts of the couple and the intangible euphoria of love are never the same. Sandi + Trey, thank you for welcoming me to document such a momentous and beautiful occasion. To witness the love that the two of you share was refreshing + breathtaking--a true testimony to the kind of love we are all searching for. I can’t wait to see what the future holds for people as amazing as the two of you. How adorable is her flower girl?? I loved Sandi's vision of festive Spanish colors come to life! I felt so lucky to witness such a beautiful relationship between mother and daughter. The first look prior to the ceremony. Loved these beautifully carved large wooden doors! So many beautiful locations to shoot at the La Quinta Resort. Vox DJ's getting the party wild!